Level 5 is the second gymnastics level that gymnasts are required to compete. 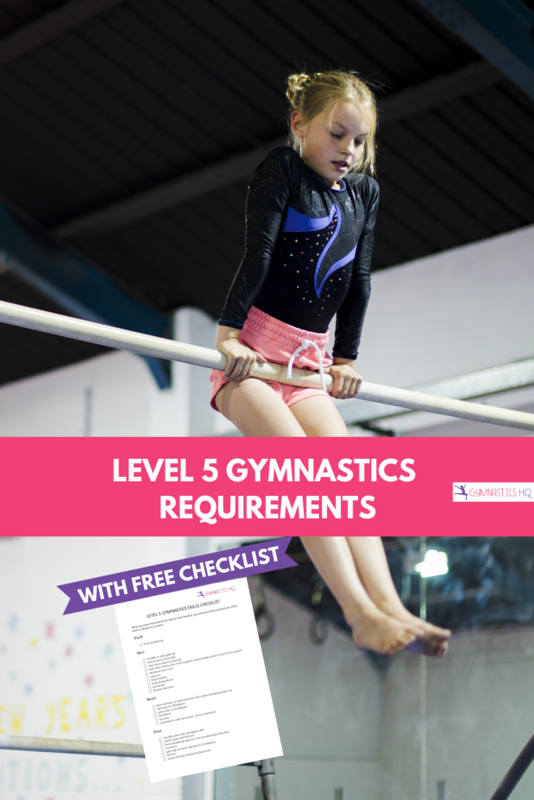 Level 5 is a compulsory level, so each gymnast does the same routine. 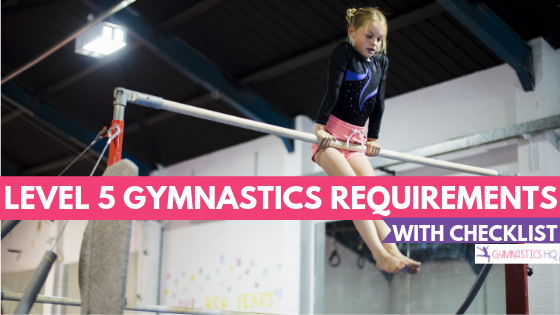 To compete in level 5 gymnastics, a gymnast must have reached her 7th birthday before her first meet and be able to do the following skills on each of the four events. She also must have scored a 34 AA as a level 4 at a sanctioned gymnastics meet. We’ve starred the skills that are generally the hardest for gymnasts to learn and most often prohibit a gymnast from moving on to level 5. 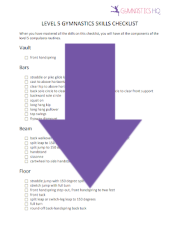 Be sure to download the Level 5 Skills Checklist below. Once a gymnast can perform all of these skills and she has learned the Level 5 gymnastics compulsory routines, she is ready to compete in a Level 5 meet. And once she successfully completes Level 5, she can move on to learning Level 6 skills. I have a question about the new level 5. Will the girls be scored different if one does a back walker, or a back handspring. Are their starting scores higher if they do the more difficult tricks. What score is needed to qualify for states? There is no change in start value for choosing to do either a backwalkover , a back extension roll, or a backhandspring step-out (on beam). So, in other words, they won’t be scored differently. In higher levels starting scores change for doing more difficult tricks,but not in compulsory levels. And as far as score needed to qualify for states–that is decided by the state for level 8 and below. But, frequently it is around 31 or 32.
hello i was put in the wrong lower level when i can do all the level 5 skills what should i do? i have perfected all my skills and am ready to move on. You should talk to your coaches or district coordinator and see about it then at the next level test try for a higher level. I am currently in Xcel and want to join Compulsories. I can do all of the level 5 skills. How can I join compulsories? You would need to ask your gym about doing Compulsories. If your gym doesn’t offer it–you might want to check other gyms in the area. Some gyms host mobility meets, which are small meets specifically for moving gymnasts from one level to the next. But they are still USAG sanctioned meets. Any meet which is USAG sanctioned will work for qualifying out of a level 🙂 Hope that helps! Is there a certain score they need to reach to quality out of Level 5? They need a minimum of 31 All-Around to qualify out of Level 5. This has to be at a USA Gymnastics sanctioned meet. I’ve heard that you have to score above a 34 AA to move to level five, do you know if it has changed? Yes, it has changed to 34.00 to qualify up to Level 5. I can do everything g in level 5 except for the back tuck, Any tips??? Hi im am a self taught gymnast currently level 2 but im planning for more kevels right now is that good? Hi! My daughter is 8 years old and on level 4 and I was just reading this to see what skills she would need for level 5, and I was just wondering why you have to be 7 years old to compete in a level 5 meet? I know it doesn’t affect her but I was just wondering. Yes, you’re correct. It did change to 34.00. I just finnished my level 3 state competition today with a 37.4 AA. I have already mastered level 4 skills, and I am 13 years old. I was wondering if it is possible to skip level 4 and go directly into level 5. I have all of my level 5 skills but they just need a little cleaning up. With the score I got at state is it possible to skip level 4 and go directly into level 5? Or must I score out? My daughter is 8 and working at level 5, which she will do this July. Will she be in age or out of age? If a gymnast scored out of level 5 with a 31 is she allowed to skip level 6 and move right to level 7? My coach says that I’m ready to go to level 6/7 but my head coach says that my bars and flips need too improve. Should I go to level 6/7, 5/6 or stay on level 5. P.S My sister says I should go to level 5/6 (I have competed. Hi! Love your website! How is your $19.99 Skills Progressions Checklist different from the free Skills Checklist (ie Level 3, Level 4, etc.)? Thank you! Hey, i am 14 and i am currently still working on my straddle jump any advice ? Hey, for floor, the ending pose. Do you hips have to be on the ground or can they be off the ground? I was wondering, what is the usual age for level 5? If it says like level 5 requirements does that mean you have to be able to do all of these to be on level 5 or does it mean you are learning this in level 5? hey I am 12 and want to go into competitive gymnastics and it says I need to have scored a 34 AA as a level 4 at a sanctioned gymnastics meet am I too old, and also I was wondering If I feel I would go into level 5 could i ?